incorporate observations from a real work of art with ideas from their imaginations in a creative writing exercise. Warm-up: Give each a student a blank sheet of paper. Have them fold the paper in half, then in half again, and again, until they make a grid. Have them take one of the magazine pictures and divide it into the same number of grid squares. They should draw what they see in each grid square of the magazine picture onto the corresponding grid square of the paper they folded. Tell them this exercise is simply to give them a sense of how the process works, not to make a perfect replication. 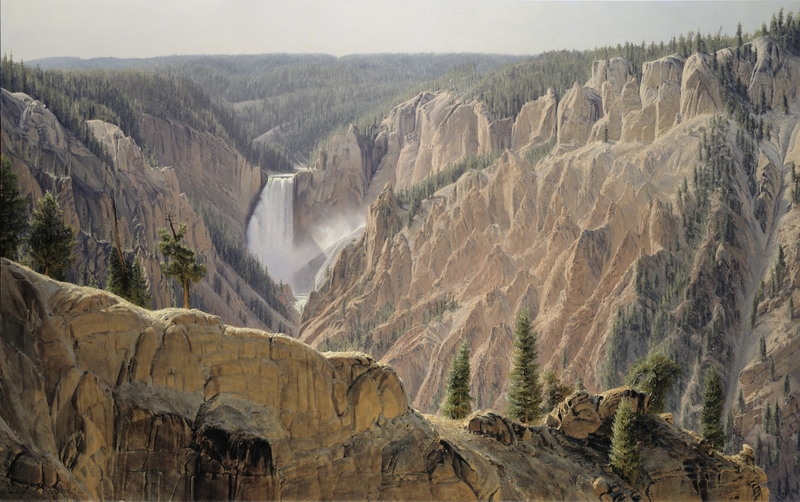 Share the painting Grand Canyon of the Yellowstone with the students. Use the About the Art section and talk about the artist’s process and motivations. To give students a sense of the scope and size of this painting, tape pieces of butcher paper together to match the size of the actual canvas of the painting. Create identical grids on the painting and the butcher paper using rulers to draw straight lines. Have students transfer, in rough form, the images from the painting onto the corresponding grid on the butcher paper. You can divide students into groups of 3–4 and assign each group a section. If you have room, you could have several groups each do a complete painting on their own. Discuss the experience. Why would the artist paint the piece so large? What impact might his experience as a pilot have had on his decision? Warm-up: Read a short section from a travel guide. Have the students write their own travel entry about a place they’ve visited in the past. They should include active verbs, descriptive nouns, adjectives, and adverbs in their entry. Show students the painting again and share that travel is an important aspect of the piece, as the scene painted is frequently visited. Have students write a travel guide entry for the painting. They should include: how someone could get to the site, a description of what they might see and hear, and other details of interest. To really let their imaginations go, they could become a different character when writing their travel guide and write it for a non-human audience (i.e. aliens, Frankenstein, Godzilla, a fairy, etc.). They should come up with a fun title for the travel guide they are writing. Have the students share their travel guide entries in small groups. You might call on a few students to share their entries with the class.